You know what happens when a company grows? Well, lots of things actually, but the one on my mind for the last year or so is outgrowing our physical space. 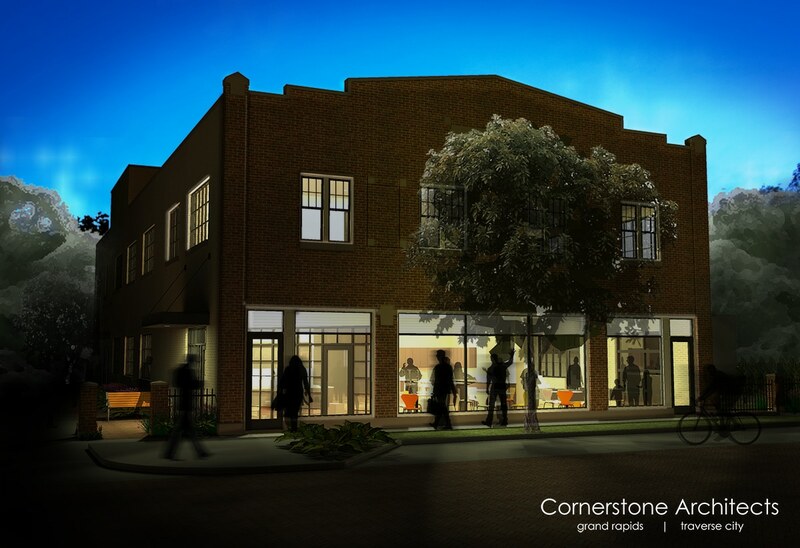 Our home in Grand Rapids at the corner of Wealthy & Diamond really isn’t big enough for us anymore. While out on a Sunday dog walk this past winter, I happened upon a larger building for sale at 1034 Wealthy—just a few hundred yards east of our current home. I got pretty excited to learn that it had just gone on the market the day before. We wrote an all-cash offer a few hours later. 1034 Wealthy back in 1936. This building, where we’d like to move Atomic Object, had been the long time home to Grand River Builders. 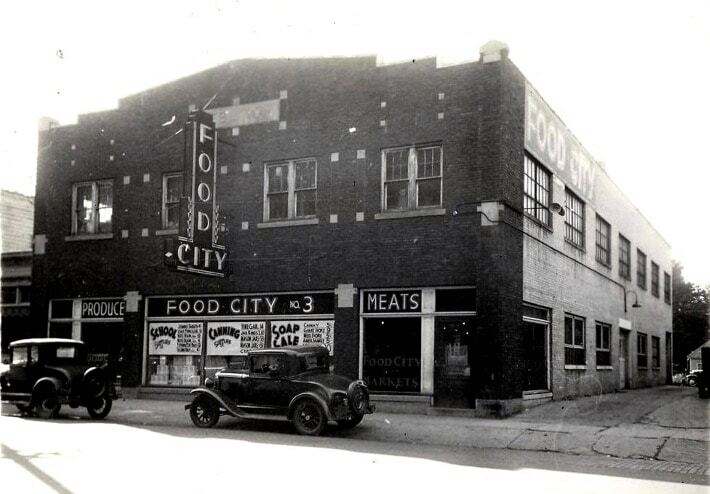 We did some research and learned that it’s also been the home to Berger Chevrolet and Ebling & Son’s Blacksmith — both Grand Rapids businesses that have reached their centenary. That’s pretty inspiring for a company with a vision to be 100 years old. 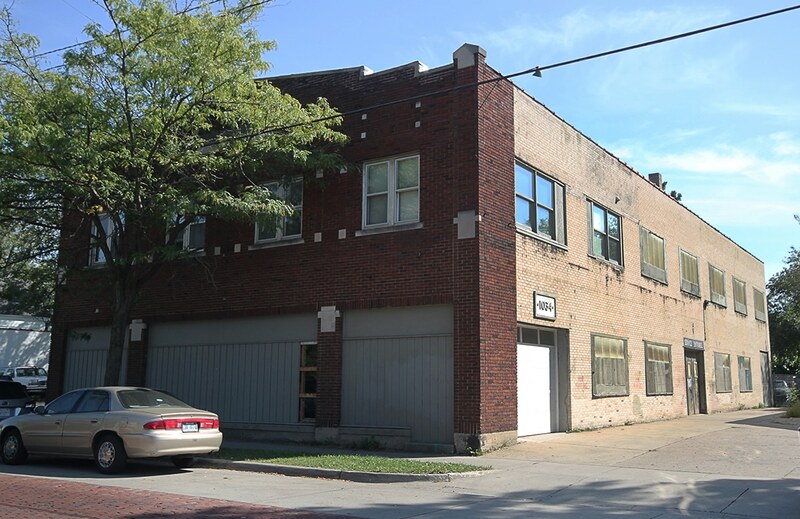 Before we can make a home at 1034 Wealthy, it’s going to need some major rehabilitation. It might not look like much currently, but this building’s got really good bones. There are a few challenges to rehabilitating a nearly 100-year-old building in a beloved historic neighborhood. Historic District – Our portion of Wealthy Street is in a historic district. 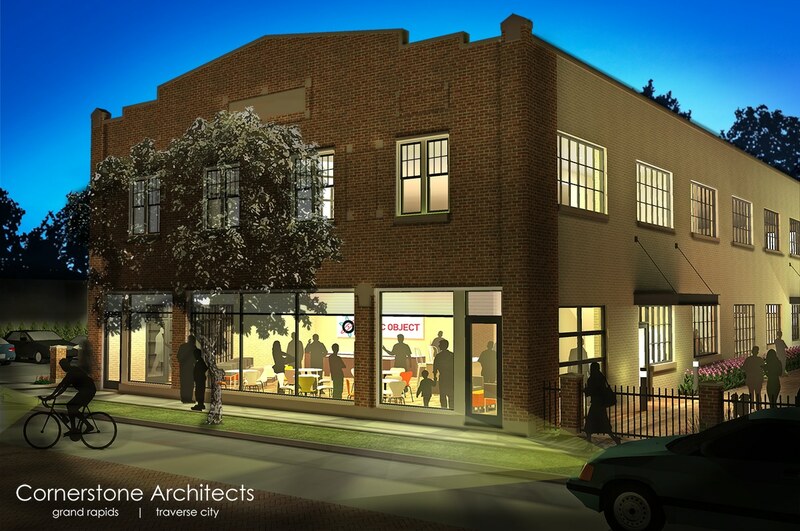 We chose an architect and a construction contractor with strong track records in adaptive reuse and historic renovation. Thanks to Tom Nemitz and Shannon Trumley of Cornerstone Architects and Jason Nyhuis of Pioneer Construction. 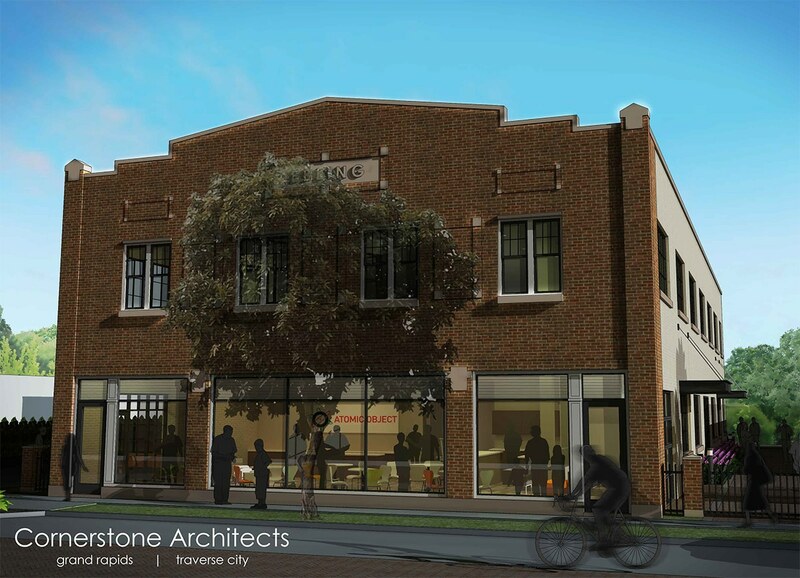 With their expertise, we got approval of our renovation plan from the city’s Historic Preservation Commission on our first attempt. State & Federal Tax Credits – The upside of being in a historic district is that we’re eligible for federal historic tax credits. The State of Michigan will also hopefully help our project’s viability through the Obsolete Property Rehabilitation Act. This means more applications and reviews, but vital support in the form of tax relief on the value we create in rehabbing an obsolete property. This will help make our project commercially viable when it would otherwise not be. Grand Rapids Commissions – The biggest hurdle we face, and one we’ve yet to overcome, is getting a special land use variance from the Grand Rapids City Planning and City Commissions. Our variance request is to use both floors of our new building for office space. The zoning of our section of Wealthy Street is Traditional Business Area which favors retail usage for first floors, and either office or residential for second floors. Some people look at the long list of meetings and approvals we need as a hindrance to business. It’s true that the process seems to take a long time. But I’ve visited some places (Lagos, Nigeria comes to mind) where no one much worries about zoning or building standards, and I wouldn’t want to live in one of them. We’ve had nothing but encouragement, great advice, and guidance from Grand Rapids in navigating these tricky waters. Staff people in the Economic Development, City Planning, and Historic Preservation offices have educated and advised us. Our elected officials have provided support, advice, and encouragement. I’ve got to think that our positive experience with the public sector in Grand Rapids explains, in part, our city’s past progress and huge momentum. The City encouraged us to bring letters of support to our upcoming commission meetings. We asked our neighbors and neighboring businesses if they’d be willing to write something on our behalf, and we’ve gotten a great response. More than 35 of them have written letters of support for our use variance. BNA strives to retain businesses within our community. With their 35 employees, and the money they spend in the neighborhood, Atomic Object positively contributes to the economic vitality and sustainability of our neighborhood. Are you kidding me? An office building stuffed with hungry bodies, 4 doors down from my butcher shop? Hell yes. Atomic Object has been a good neighbor on Wealthy Street since 2003. Their 35 employees, and the money they spend in the neighborhood, positively contribute to the economic vitality and sustainability of the neighborhood. The excellent work they produce and the high quality jobs they create also provide a benefit to the local tech industry and the region overall. This thriving business has contributed vastly to the positive redevelopment of the Wealthy Street corridor. Atomic Object’s team provides a valuable model of how 21st century businesses can re-use 20th century buildings and contribute to a vital urban core. We’ve also gotten unqualified support from the Baxter Neighborhood Association and the Wealthy Street Business Alliance, along with some helpful ideas from the East Hills Council of Neighbors. We decided the company was going to own our new Grand Rapids home. This is one of those decisions that’s contrary to conventional wisdom, but falls naturally out of our vision of being a 100-year-old firm. If we’re planning on being around that long, why shouldn’t we buy a building for our headquarters? Because of our broad base of employee ownership, all 25 employee owners will benefit from the long-term investment we’re making, and the value we’ll build up as we pay off our mortgage. We think we have a strong argument for keeping Atomic on Wealthy Street by granting the land use variance. Hopefully the City Planning Commission will agree at their September 24 meeting when our case will be considered. If we’re successful, the new headquarters of Atomic Object will look like this by mid 2016. Congrats on your continued success and wisely managed growth. The rendering of the new place looks fantastic. This is great news! Our family lived in Eastown and I operated a small business for many years at Lake and Diamond. I’ve watched the revitalization of Wealthy Street over the past 30 years, both as a resident and business owner. Cherry Hill, East Hills, Fairmount Square, one by one have come back as vital foundations to the community. It’s been especially encouraging to watch it slowly explode in the past two decades. A lot of good people and business diversity, mixed with strong grassroots community leadership — walking the walk, not just talking the talk. Your new building is a prime footprint and hopefully a lasting addition to the neighborhood. I’ll be watching for the open house announcement. Congrats! Thanks, John. It’s great to hear that historical perspective. We do indeed plan to be a part of the neighborhood for the long-haul, and I share your appreciation and excitement for the positive change and energy that’s so evident.